Enterprise Rent-A-Car is the largest car rental company in North America with over 6,900 locations worldwide. They have over 700,000 vehicles in their fleet and their locations position them less than 15 miles from 90% of the U.S.
population. Their site allows visitors to reserve a car in US, Canada, Ireland, Germany and the U.K. This includes over 200 airport locations as well as the branch in your hometown. Cash back is not available on automobile purchases or commercial rentals. Use of coupon/promo code not found on Extrabux may void Cash Back. Cash Back may not appear in your Extrabux account until up to 40 days after travel has been completed. 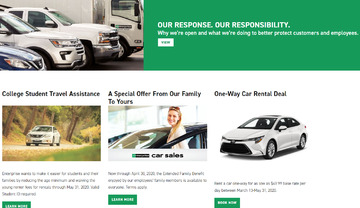 Click a Coupon or click Start Shopping to earn 0.5% Cash Back at Enterprise Rent-A-Car.